In order to meet its high availability pledge to customers SunGard needed an exceptionally reliable UPS that could deliver redundancy without occupying a lot of space. The Power Xpert 9395 answered the call for high availability, packing a premium power protection solution into a small footprint — and delivering high efficiency to boot. The demand for high availability within SunGard’s Philadelphia data center is essential not only for its own business operations, but for those of its customers. Supporting hundreds of clients at the site, SunGard is tied to stringent Service Level Agreements (SLAs), including the promise of continuous uptime. 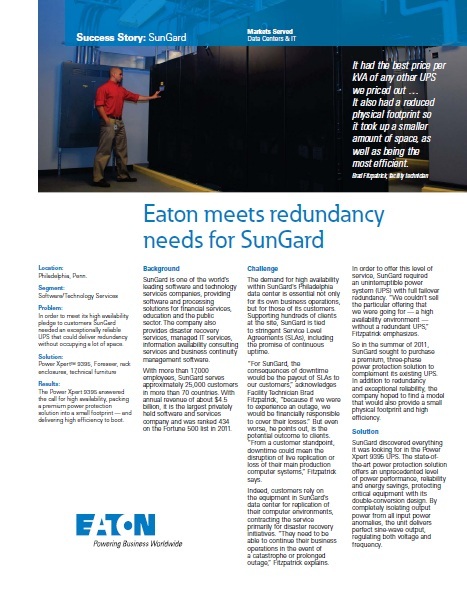 SunGard sought to purchase a premium, three-phase power protection solution to complement its existing UPS. In addition to redundancy and exceptional reliability, the company hoped to find a model that would also provide a small physical footprint and high efficiency. Having installed a 550 kVA Power Expert 9395, SunGard is relishing the heightened level of availability afforded by the cutting-edge UPS.